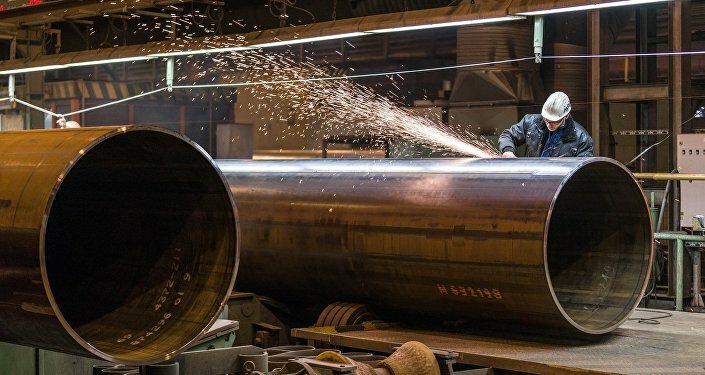 Earlier in January, European companies participating in the Nord Stream 2 project aimed at building a new route for Russian gas to bypass Ukraine received threatening letters from US Ambassador to Germany Richard Grenell. Sputnik discussed the US stance on the issue with Patrick Basham, the founding director of the Democracy Institute. According to Patrick Basham, the pipeline is competition or potential competition for American LNG interest. "America's opposition to the project is really based around its concern that a successful project gives Russia a great deal of economic influence over Europe, especially Germany, and that economic influence the Americans fear will be at some point in time, that there will be a political influence. America fears that in a hypothetical dispute in the future between the US and Russia, that it would for the Germans, for example, it would be harder for the Germans to back American [interest]", he told Sputnik on Thursday. The scholar noted that the US rhetoric was largely sincere but it would not have a tangible impact for which Washington would hope. "I don't think it will prove actually to be that effective at all. If we were talking about a hypothetical project that was going to get off the drawing board in five or ten years then maybe American criticism could prove somewhat effective. But we're talking about a project that is up and running where we're talking about something that is a private enterprise and there is some European support for the American position, obviously there is some strong European opposition to the American position. The timing is poor", he added. He also stated that sanctions are "definitely on the table", as Washington would be "happy to use" the restrictions against Russia, as they have a bit of bipartisan support in the US at the moment. "I think sanctions are certainly on the table, could be employed and as is usually the case in a majority of cases with sanctions, the relationship with Russia being a good example, they are usually ineffective, counter-productive and I imagine that would be the case here as well", Basham concluded. Nord Stream 2 is a joint venture of Russia’s Gazprom and four European companies, apart from Austria’s OMV AG it includes: France’s Engie, UK-Dutch Royal Dutch Shell, Germany’s Uniper, and Wintershall. The project is due to be wrapped up before the end of 2019 and envisages the construction of two gas pipelines that will run from Russia, through the Baltic Sea and to a hub in Germany, entirely bypassing Ukraine, which opposes the construction of the route along with Poland and the US. Washington has consistently spoken out against the project, claiming that it will increase Europe’s dependence on Russian gas. President Putin, for his part, said that his American counterpart Donald Trump was pursuing the interests of US companies to sell more expensive LNG to Europe.